This is a quick tip, and really a simple way for me to remember this simple way of converting n-gons to quads when I need to. It is actually easier to turn n-gons to tris, as that is one less step in the procedure. First of all, a word of warning – as is usually the case in life, quick and dirty, or easy fixes are usually only good to a point. This method of converting n-gons to quads will still leave tris (polygons made up of 3 sides AKA triangles) and will not get EVERY single polygon and perfectly turn it into a quad. That being said, if you don’t want a quick fix, but a perfect result, then you will likely have to retopologise by hand – so you better get started. However, before you do, why not try this quick fix and see if the results are suitable? When did I first want to use this? 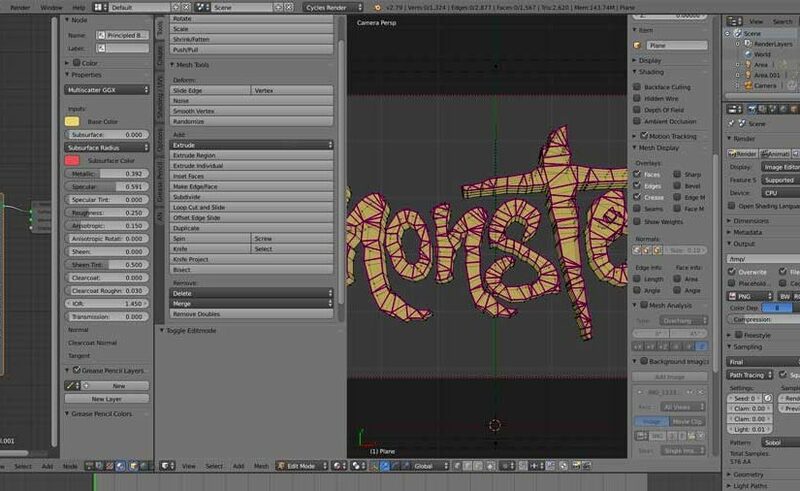 I was creating some 3D rendered text, and I decided to create the font by hand. Firstly I scanned some hand-drawn art and then started tracing it in 3D. The trace left me with outlined text, but not filled. In blender 2.79, as you’ve been able to do for a while, you can select any amount of vertices and hit control F to fill the vertices with faces. The new way of doing this is to create an n-gon that fills the entire space, which is great for ease, but n-gons aren’t great for animation or subsurface. So as soon as I added a subsurf modifier, the dreaded n-gon sub-surf thing happened. I didn’t want to redraw the text using quads, and I only wanted a quick render, so a quick and easy way to convert ngons to quads was all I was after. Surprisingly I googled it and the first few answers didn’t use this method and were much harder to achieve some needing plugins/add-ons. This method of converting Ngons to quads doesn’t rely on Blender add-ons and uses only blenders built-in functionality. In my case, the majority of my object was created with Ngons, but sometimes it is only a few gremliNgons that crop up as if my fricken magic. Don’t fear though! There is a way to select N-gons like magic, using the needle-in-a-haystack-finder (That’s not really its name). Now, in the tools menu to the left on the 3D view (in default layout), you will open up some settings. From the drop-down select, Greater than and then keep vertices at the default of 4, as 4 is how many verts you need in a quad (four corners of a square). Now all the polygons with more than four verts or edges are selected. Fantastic. As far as I can tell, there is no way to jump this step, and some people will be fine with tris (triangular 3-sided polygons) as opposed to Ngons. You can either do this through the menu or simply hit Control T.
Via the menu, go to Mesh > Faces > Triangulate Faces and BOOM, you have Tris. If you are happy with that, you may want to get off this blender-train right now, but if you want to find out how they get to Quads, or how, I suspect, ALT J (an awesome band) got their name, you may want to hold out for 1 more minute. Now, back down to the menu and select Mesh > Faces > Tris to Quads and voila! you have achieved what you set out to do. You may notice that not ALL the faces have been converted, but Blender has used all the faces it can in the way it deems best to fill. You haven’t left it enough verts to fill everything as a quad. Ok, I came back as I forgot my hat… But even though they aren’t all quads, there is now, however, a lot less to clean up – it is up to you if you need to or not (I didn’t). Why are Quads Preferred For Rendering Anyway? It’s all to do with maths and subsurfacing. A square is easy to divide into 4 smaller squares, even I could do it. And then those smaller squares again into smaller squares – and that is the process of the subsurface. It means we can work with a low-poly model, but use a subsurf modifier at the render stage and get super smooth edges. It also means we can choose how much subsurfing should happen at the end of the process. What’s this all about I hear you ask. Well, while trying to learn some Zbrush, I thought I would work on a competition over at Sketchfab. I chose to recreate Finn from Adventure Time in 3D. I had never used ZBrush, or Sketchfab before, so it was a great chance to learn. 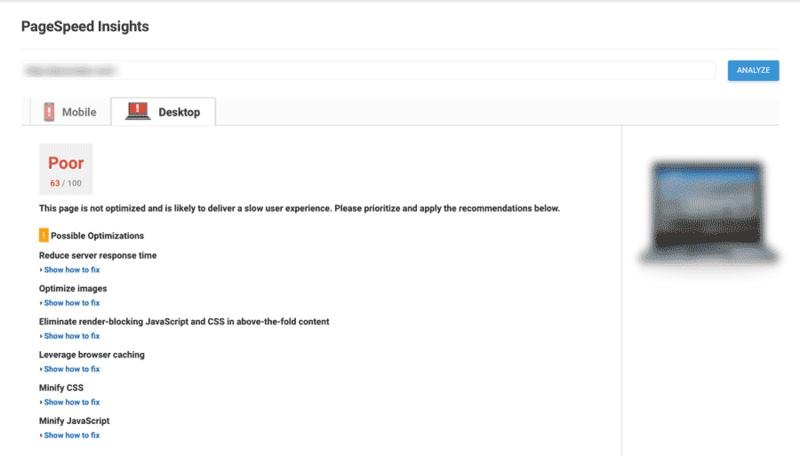 Ok, so, If I’m honest, we probably wouldn’t be doing a review of the Godaddy Managed WordPress package (Managed WP for short) if it all went perfectly well. When I decided to go with Managed WordPress, it was because I had been won over to the idea during a phone conversation with GoDaddy about a technical problem. It happens a lot, with almost every big company, so I don’t dislike GoDaddy for the “upsell” tactics they usually employ – you get that everywhere. When I first looked into managed WP hosting, GoDaddy was quite expensive, but every time they spoke to me and tried to upsell it, the price went down. They would always start with “I see you’re running a WordPress site,” which I was, and then go into “Have you thought about managed WordPress?” before they list all the benefits. Which benefits? There are *some* benefits. Yes, there are some good points. The main draws were that you could easily migrate the site from your current hosting, you could get them to do it over the phone or do it yourself – I have done it both ways for different clients. You need to put your website address into a little box, and fill in the admin username and password. It then migrates the site over to the new hosting package. Simple. Was it pain-free? Mostly yes, however, there were a few links to images that needed updating. Also, if it matters to you, there is a chance that all the posts will change to the new admin as ‘author’ and you would need to change back once migrated. This issue could have been an early issue that is now resolved, but I’m always surprised if there is no clean-up to do. But simple enough to fix and not an issue for me as the site wasn’t going live until it had been redeveloped. If you do use the one-click migration service and do it over the phone, one caveat is that they do not ask you where you want your server to be based, or at least they didn’t ask when I used the service. My client and I are located in London, England, and as such we would prefer the European service centre or hosting location to increase speed to our customer base that is predominately in the UK. When we completed the migration ourselves, we had the option of which data-centre to use. Hint – you should use the one nearest your customers and then use a CDN to boost the performance. Oh… CDNs… I’ll get to that in a bit. You may not know what this is, but it can be convenient in some situations. The basic idea is that you have a live site, i.e., example.com – where your visitors can see the site, and also have another version of the site that no-one can get to but you. The Staging site is to check updates, and changes work before you then push them to the live site. With GoDaddy Managed WordPress, the staging works rather well. You get as staging site at 123456789.examplestaging.com that you can update and test to your heart’s content, then when you are ready and know that everything works great, click the button that says Staging to Live, or similar, and the staging site is copied over and is now live in all its tested-everything-already glory. The same can be done in reverse, so if you make minor tweaks to the live site, you can click the button ‘copy live to staging’ to over-write the staging environment with the current live version of the site, so you can once again start upgrading and testing something else. Fantastic. Staging is a genuinely helpful feature, and either you will see the benefits or you won’t. If you don’t see the benefits, then you probably work on your own site and don’t need to pass and check EVERYTHING before accidentally breaking your client’s site. Good for you, but some people will benefit from this. Ok, the Benefits Sound Great! Where do I Sign Up? Woah there! Hold your metaphorical horses! Those are some great features, but they are not only offered by GoDaddy, there are many other alternatives. Also, I was nice, starting with the good points, because from here on out we have the bad. Once upon a time, in the year of Game of Thrones Series 7 – 2017, we wandered into a murky wood of obsolete servers. Ok, I got bored, so thought I’d spice it up a bit… moving on. The blacklisted plugins aren’t inherently wrong, but In practice, it isn’t great and causes problems. Why do they Blacklist Plugins? You may already be aware of WordPress plugins as you are reading this, if you aren’t aware, then they are small programs or apps that extend the functionality of WordPress in any number of ways. Popular plugins such as Woocommerce can help you set up an online shop. There are plugins to insert an Instagram feed in your site easily. If you want your website to do something it doesn’t do out of the box; there is probably a plugin that does. Well, yes, however some people get a bit carried away, they install every cool sounding plugin that comes out and soon, their website is more plugin than a site. Each WordPress plugin you install has an overhead. It will need a little bit of server memory and server time and by adding more plugins you will start to slow down your site. Only add the best of the best, and if it isn’t necessary, seriously consider removing it to speed up your site. But, you will need some, and I even have a list of the best WordPress plugins you need to install today for a better WordPress website. You will need security plugins and anti-spam plugins, and if you want a fast WordPress site, you will want a cache plugin. But people do abuse plugins, so it makes sense for GoDaddy make a list of the bad plugins, the ones that hang out in saloons for outlaws and make other bad life choices. Unnecessary/nonfunctional, performance, security issues, duplicate functionality and more. The full list can be found here. I don’t care about those plugins, that’s fine, no one wants to install those plugins, but they also blacklist EVERY SINGLE CACHE PLUGIN. This lack of caching is such a game changer that had I known before buying the Managed WordPress hosting; I wouldn’t have bought it. Why do Godaddy Blacklist Cache Plugins? Good question, and honestly, I actually don’t know, but they definitely won’t allow you to install them. The problem with the GoDaddy Managed WP Hosting is that the blacklisted plugins are blocked from even being installed, it’s not like they just strongly advise you that they shouldn’t be installed, they wholly block their installation. It’s ok! Godaddy Provide their own proprietary cache. If I had been told I couldn’t use a cache plugin, then I may not have bothered with Managed WordPress, however, if they had said “Don’t worry, we have our own cache that is better than a cache plugin” then It may have won me around. *Spoiler Alert – They did say that the first time I had an issue with the fact I couldn’t install a cache plugin. I may even be won over now if this was in any way true. But alas, it is not. The GoDaddy Managed WordPress Cache is categorically a piece of f*&£%*$ Sh!*. Sorry, but it’s true. What’s Wrong With The Cache?! 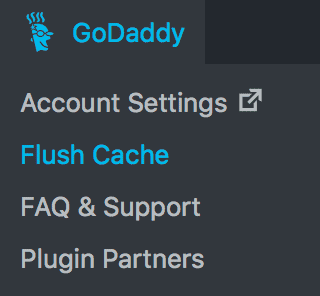 The built in cache may be super simple to use, the only way you know it exists is because there is a little GoDaddy icon in the top bar and if you hover over it, there is a drop-down that says flush cache. But besides that, it is about as useful as a chocolate teapot. Actually, no; you could eat a chocolate teapot. There is so little evidence that the cache even exists, except that in every version of the Managed WP that I have used there has been a massive error that shows a white screen and error code to some people. After talking to Godaddy Customer support, they confirmed it was an issue with the cache and deleted it. That’s great, but there is no alternative to their own cache. They assured me that they super fast SSD based server didn’t really need a cache anyway. I listened with my young, naive ears and believed their lies. If you run a website, and you take it seriously, you may know that page speed is important. 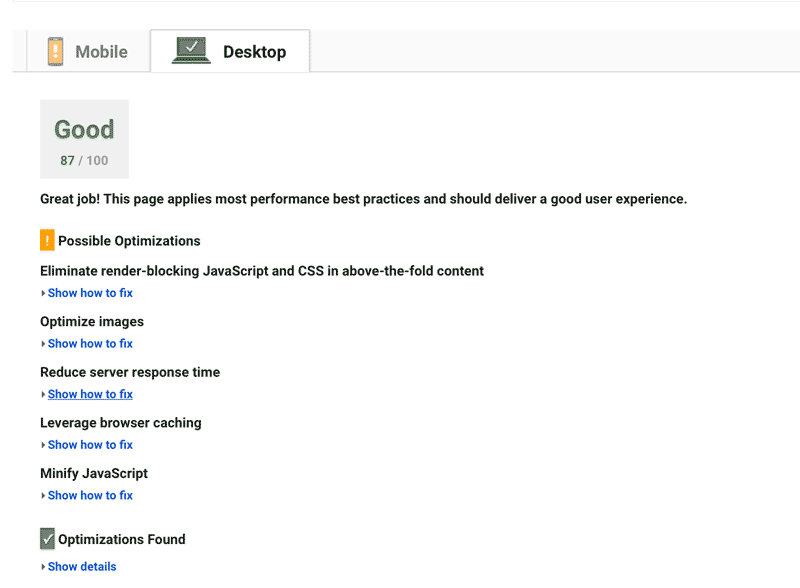 There is even a handy tool from Google called PageSpeed Insights where you can test the speed of your site, and it will give you tips on how to improve it. If you work in SEO or have an interest in it then you probably already know that page-speed is important. If you don’t, you can read why page speed is important for SEO here. As you can see from the image, the site loads much faster, but even if you optimise the images to hell, it won’t speed up the initial server response. We are often looking at a 3 – 4-second server response and my other site is running at 0.2seconds and might I add, still seen as slow to Google PageSpeed. How is it so fast? Well, the main thing is that the other host allows me to use whichever cache plugin I desire. I have even spoken to a few hosts to confirm that they allow any plugin on their Managed WordPress hosting (and they do?) – so it seems like it is limited to GoDaddy as an issue. What does a cache even do? If you haven’t already installed a cache plugin and you run a WordPress site, then stop what you’re doing and install it now! It will give you the biggest speed improvement imaginable. Unless you’re on Godaddy Managed WordPress Hosting though – you’re not allowed. Awkward. A cache will make a static version of your website’s pages so that instead of having to make them dynamically every time a visitor goes to your site, the cached version is sent as a static HTML file. The benefit is super fast page delivery that doesn’t need to be created by the server side PHP. Caches are VITAL if you get a lot of visitors, and maybe only beneficial if you don’t get many. But almost always lead to improved loading speeds and thus better user experience. I mentioned PHP, and that is a nice segway into the next issue. Godaddy’s Managed WordPress Hosting uses PHP version 5.6.X, and if I’m honest, I guess that’s ok. But it is still pretty old. Some WordPress hosts have been offering PHP 7 for ages, whereas GoDaddy had only started offer PHP 7 in their standard CPanel hosting packages earlier this month. GoGranDaddy more like. Amirite? When they finally started to offer PHP 7, I thought I’d give it a try. I switched one of my less important hosting accounts to PHP7, and suddenly WordPress was FAST! It is undeniable how much difference just the PHP version makes, and besides a decent cache plugin, is one of best ways to speed up the site across the board. I have been talking to GoDaddy today, complaining about the hosting and seeing if they will give me a refund on the remainder of the hosting. They said they would, but only for an ‘upgrade’ or cross-grade to another GoDaddy hosting plan. The thing is, at this point, myself and my client have lost faith in Godaddy and everything they say to get you to spend your money. I’m fed up of finding the shortcomings that they didn’t inform me existed. I spoke to them in the online chat form, because it means I can keep a transcript of the conversation for reference. Funnily enough, GoDaddy still says, and I quote: “WP is not recommending 7.0 or 7.1 yet”. And that was true the last time they fobbed me off with that response, except it wasn’t really that they didn’t recommend PHP7, it was just that you didn’t need it to run it. Think about any computer program, like a game; it will always have the minimum specs needed to run and then the recommended specs for the awesome stuff. WordPress is essentially a computer program and has minimum and recommended specs to run. However, GoDaddy is now lying, and it is a lie I hear every time I mention PHP7. and then it even supplies an email template to copy and paste so that you can ask your host if they do offer PHP 7 and simultaneously shame the ones like GoDaddy that don’t. Is PHP 5.6 so terrible? No, it is still supported, kind of, but is getting old and for a company to sell a WordPress specific hosting option that doesn’t even meet the recommended requirements of WordPress themselves? Does that seem right, or even ethical to sell as a product? It’s like selling a snow tyre that doesn’t meet the safety requirements of being used in the snow. Ok, maybe it’s not like that, but I can’t think of a good example right now, OK!? Wow, more bad points! Are there any more good? 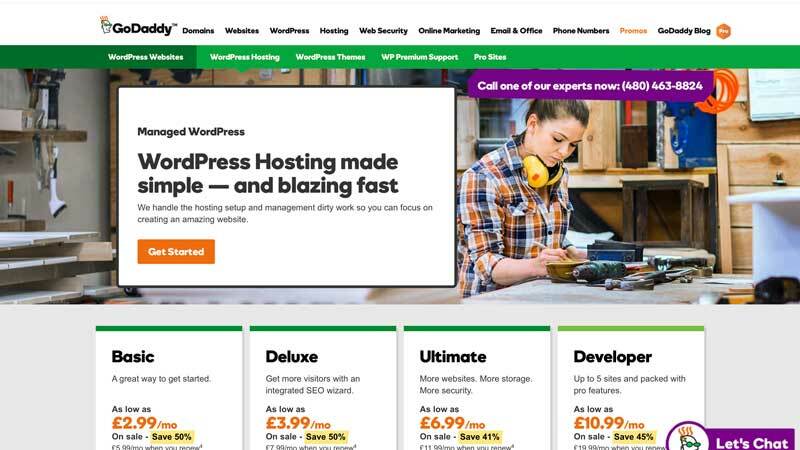 The main header image on the GoDaddy site says “Managed WordPress. WordPress Hosting made simple — and blazing fast” but I honestly don’t know how they can say it is blazingly fast when their standard hosting would be faster for WordPress. False advertising? Maybe there is small print that the blazingly fast bit is, in fact, the Godaddy control panel and not your actual website. Maybe I was a sucker. Access to 1,000s of free themes and plugins – This is a moot point as that has everything to do with WordPress itself and nothing to do with the Managed WordPress hosting. Free daily backups & 1-click restore – This is a beneficial feature! This can be put down as a plus point, but better hosting providers offer this too, and it isn’t particularly exceptional in the market. Premium WordPress Hosting platform – If any other “premium” service had service so bad it wouldn’t exist for long. Free domain with an annual plan – Most GoDaddy hosting options include a domain and so do most other hosts. One-click migration tool – We have covered this, and it is one of the few plus points, but again, not exclusive to GoDaddy and if you want this feature, we will list the hosts that offer it below. Free 24/7 support – I like this, and I have had to use it on many occasions. I think I’d prefer it if I hadn’t used it so much. There are also plenty of hosts that do now offer 24/7 support, and it is a big selling point for me as I tend to do a lot of website work in the evening when you don’t get as much web traffic. Automatic WordPress core software and security updates – This is good if you are lazy or have too many sites to keep track of, but again it is available from other providers, and I will make a comparison below. 99.9% uptime promise and money-back guarantee – 99.9% is touted by most hosts these days, and the money back guarantee sounds like it is to do with the uptime, but if you hover over it, it is simply a 30 day period that you can change your mind. I am not 100% sure if you can claim any money back if it doesn’t meet the 99.9% uptime, but I doubt it from the ambiguous wording. Temporary domain name – this is an excellent feature and is linked to the staging environment that I discussed in the good points section. Not all hosts offer this as standard because it isn’t always necessary. They provide you with a domain name that looks like this: 1a234bc56.exampledomain.com and means you can work on your site without anyone stumbling on it by accident. I feel mean, but it is hard to sing the praises of Godaddys Managed WordPress Hosting when your WordPress site will perform better even on GoDaddy’s bog-standard hosting. Their standard hosting now has PHP7, that Managed WP lacks, and you can run any cache plugin you want without the ever watchful eye of GoDaddy stopping you as they do in managed WP. It is ridiculous and makes their product redundant that in most scenarios Managed WP won’t out perform their basic hosting plans. Now, if you move to another host, you will see even more significant gains. This might be a perfect fit for someone, but if you are installing the newest version of WordPress, it isn’t for you. Listed in alphabetical order with no implied importance. I haven’t yet tested these suppliers but will get back to you when I do. I have started using 1&1 to host a WordPress site and so far it is leaps and bounds above GoDaddy managed WordPress. I hope that helps some people out there and I wish this existed when I was looking for Godaddy Managed WordPress reviews before I bought it. Posted on August 25, 2017 August 25, 2017 Categories WebTags Comparison, GoDaddy, Hosting, Online, Page Speed, Plugins, Review, SEO, tips, website, WordPressLeave a comment on GoDaddy Managed WordPress Review – Is it Worth It? For those that know me, this is no surprise – since I was a child, I was completely in awe of all manner of imaginary creatures, fantastic beasts, and legends that contained them. From the minotaur to dragons, to gryphons and everything in between, I was completely captivated! My love of all this fantastic and fantasy in films meant that I completely adored the Harry Potter movies and Lord of the Rings – I think I saw Fellowship of the Ring 7 times… at the cinema! When I was younger, I read all the Greek myths I could find, In the hope of stumbling across a new, as-yet unseen-by-me-creature to add to my imagination. I couldn’t get enough! When I was younger, I would draw those creatures and as I grew up, I never really grew out of it. A few years ago I even started to work on an art book of all the fantastic imaginary creatures I had found over the years, but work commitments and general lack of time made it hard to complete. Now I have been given a chance to rekindle my love for these creatures with the help of the guys at ImaginaryCreatures.co.uk that are compiling a list of the legendary creatures from myth and legend, from all over the world! It is fascinating to learn about so many new creatures! My speciality is definitely in Greek Myth and European Folklore, So it is so intriguing to discover a whole world of myth and legend! The Long-term goal with Imaginary creatures is to compile a list of the world most fantastic beasts, and then eventually add my interpretations of the creatures with my drawings and art. 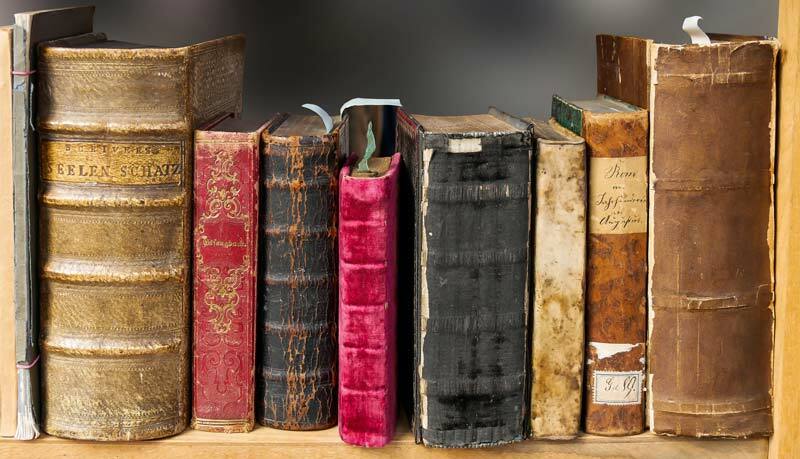 Obviously, that will take a while to make the whole list, so it is an ongoing project, with the eventual aim to creature a book (probably digital) that is available with the best of the best beasts and our personal favourites. We have only just started compiling the list, and the style and formatting are currently being developed. We hope to have the complete list by the end of the year, with some beasts having individual pages, that we will be added to gradually. 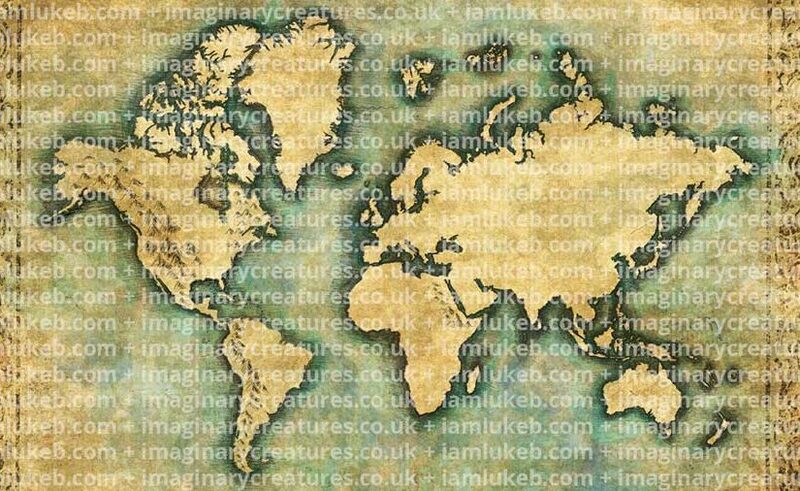 I have already started work on an “ancient” world map to show where the creatures come from and will be adding art for the individual beasts when I can. Imaginary Creatures is both a pet project and a project that is being worked on with other people, so it is a joint effort that is fascinating and daunting to be part of. It will not be completed in the usual timeframe, so please don’t be impatient with me! 😅 I really can’t wait to show what is to come with our list of fantastic creatures of legend! But please visit often, and we are of course always open to peoples input! We love it! So if you have discovered a creature that has mostly gone unnoticed, then please tell us about it! We have even considered a list of user-created creatures because sometimes peoples imaginations are even more incredible than what has come before, and all imaginary creatures had to start from someone’s mind, right? Excited about the new and improved focus on high-end pro-level Macs and VR in general. As a lover of 3D, the graphics card has always been a bit of a drawback in the Mac, especially when it isn’t really user upgradable. The idea of Thunderbolt eGPU’s has actually got me pretty excited. PixelMaker cover the whole thing, including links to Apple where you can buy an eGPU from Sonnet if you are a developer. I can’t wait to get some form of VR, but I haven’t yet decided what it should be. The entry level PSVR is a nice price, but I know the experience and higher framerate and resolution will be desired if not needed. It’s tough, especially as there really hasn’t been a piece of software that really defines VR as a “must have”. It needs its Halo, Call of Duty or Destiny. I have been helping some friends set up a LEGO blog that will feature some reviews, news, and custom LEGO projects. Everything LEGO. We hope to make some original content, such as Vlogs and custom builds. We are currently working our the details, and they are picking my brains for ideas, so it should be fun! 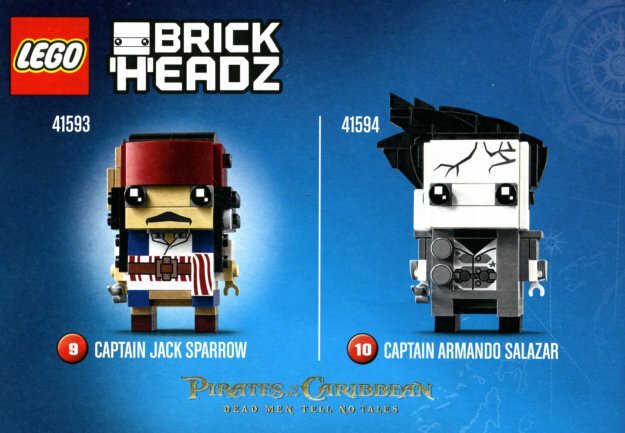 We started off with the awesome LEGO BrickHeadz, which seem like a LEGO version of POP vinyl, but better, because you get to build them! I can’t wait to see what they bring out next in the line. We hope to bring some interesting takes on the standard formula for LEGO reviews, so please bare with us while we work it all out. Any feedback is welcome as we want to know what everyone wants from it too. Posted on March 10, 2017 Categories LEGOTags legoLeave a comment on New Lego Blog! This is a little bit of fun… I thought it would be nice to add a little custom 404 page, to pay them back for some awesome work, for their Emergency Plumber 365 website. 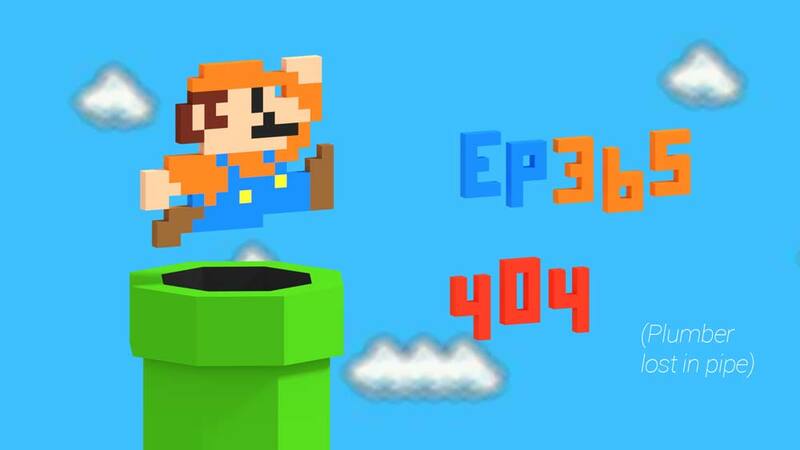 Great guys from Harrow, so I thought it would be fun to make a little 3D, but retro mario in EP365 colours. How do you add a custom 404 page? That has to do with your .htaccess file, so go hunt that down. This is for linux based, Apache hosting, so it will be slightly different for other hosting types. The file will be in the root directory of your website hosting. Set up a page, make sure it’s pretty small in file size (there used to be a limit to the size the page could be before it would simply default to the browser’s (not bowsers) own 404 page). People don’t really like to wait to then be told they are in the wrong place. So now the browser knows that if you visit a page that doesn’t exist, it should show you new404.html. Simple. I was recently lucky enough to be invited to the Doctor Strange premiere in the UK. We were treated to a surprise visit from Benedict Cumberbatch and a few of his fellow actors from the film. You can read my review of Doctor Strange here. A short video of the speech they gave is posted below. This is a small update about the train that I had made before. 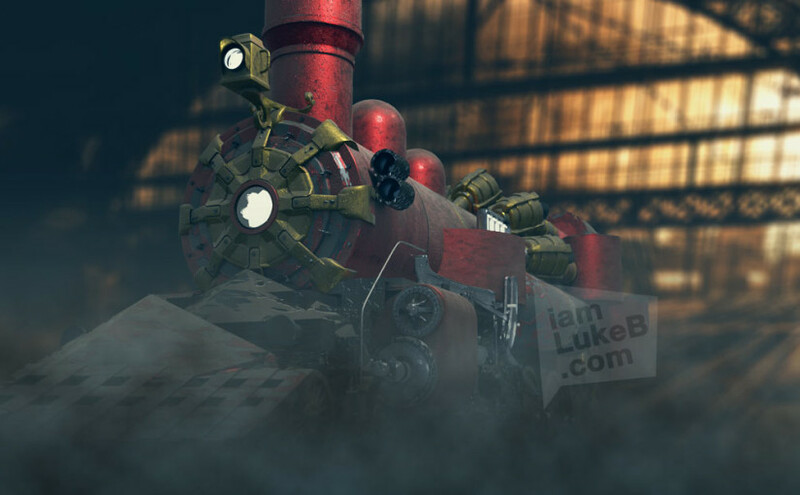 I found it pretty fun to work on all the aspects of the train – I do enjoy a bit of steam punk for sure. But then as I started working on the detail it became more and more laborious. I am not a plumber, engineer or train aficionado. I had to reference the mechanics of the steam engine and the way the wheels are driven by the steam engine itself.